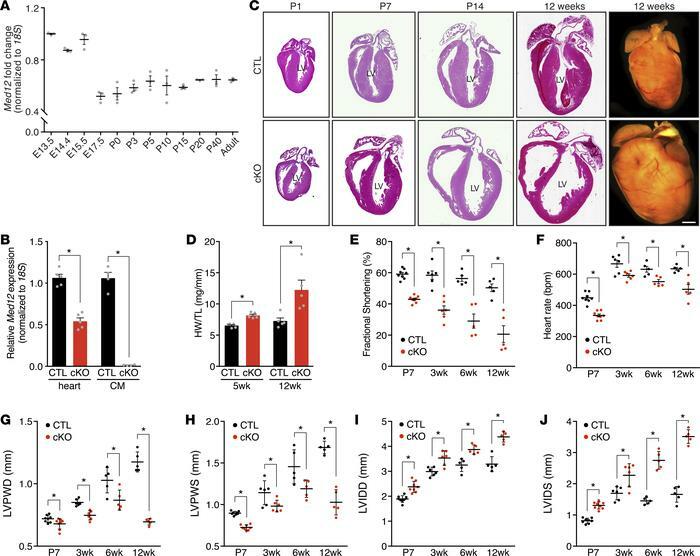 Deletion of Med12 in cardiomyocytes impairs cardiac function. (A) Med12 mRNA expression in ventricles during development and aging of mouse hearts. n = 3. (B) Med12 expression in hearts (n = 5) and cardiomyocytes (CMs) from control (CTL) and Med12cKO (cKO) male mice (n = 4–5 mice). (C) H&E staining and whole-mount heart representations of CTL and cKO male hearts. Scale bars: 1 mm. Serial sections are shown in C and Figure 2, A and B. LV, left ventricle. (D) Heart weight (HW) to tibia length (TL) analysis. n = 5. (E) Fractional shortening, (F) heart rate, (G) left ventricular posterior wall thickness in diastole (LVPWD) and (H) in systole (LVPWS), (I) left ventricular internal dimension in diastole (LVIDD) and (J) in systole (LVIDS) of CTL and cKO male hearts. n = 5–8. Data are mean ± SEM. *P < 0.05 by 2-tailed Student’s t test.